We have been very active in Colwyn Bay with a number of activities to keep the members busily engaged. It is a little difficult regarding dusty/mucky activity such as woodwork while we are meeting in the community centre but it has not stopped us from being active. Every meeting seems to have a really great atmosphere with plenty of interaction between all the guys. On Friday 27 June 2014 we were presented with a surprise demonstration of lemonade making by member David Bird. David is a retired chef with a wealth of experience and he kept us well entertained with stories from his career while showing his simple but effective recipe reproduced here for those interested. Grate the lemon rind on a medium cheese grater being careful not to take off the white pith. Strain the liquid into a jug and gently press the pulp with a spoon to obtain all the flavour. Can be used as a cocktail base, adding vodka, gin, tequila, white rum. Oranges, limes, passion fruit can be used instead of lemons. Can be warmed and used as a hot lemon drink for sore throats. We had a fascinating demonstration from one of our committee members, Norman Critchett, on Friday 13 June 2014 when he showed us the magic of putting ships in bottles. Norman is a prolific craft worker and woodturner and kept everyone spellbound with his demonstration. You can see pictures in the gallery. Some of the guys are into gardening and while we do not have a garden as such there are some planters and a small (and I mean small!) greenhouse in the yard at the back of the community centre that has been cleared and planted with some flowers. There are many activities that could be undertaken in the future and to whet your appetite, the following table should give you some idea as to the possibilities but remember this is a Shed for the men and the men will ultimately decide what happens within. 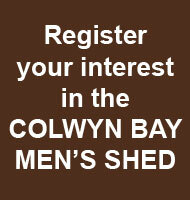 In the meantime why not check out what men in other sheds around the world have been up to.